“Final Fantasy XV’s Prompto is the Best.” For some fans, this sentence is probably pretty obvious, and some may even wonder why I’m bothering to make a case for it when there’s no contest. But during the ten year developmental hell that Final Fantasy XV slogged through, the evolution of Prompto’s character and the changes made–both in design and personality–were pretty significant. 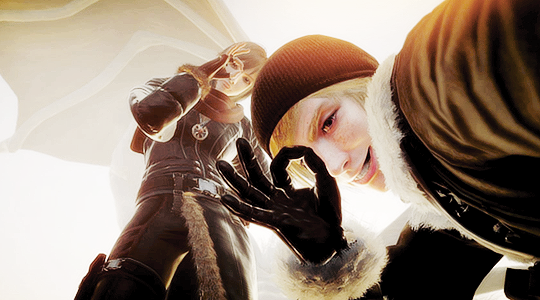 At one point, Prompto had the status of the least favorite character in the game, cited by fans as being too “annoying,” and the developers and writers had to make leaps and bounds to make him more likable. At one point, Director Hajime Tabata even mentioned that despite Prompto’s status as the least favorite character, they couldn’t justify replacing him with a different character in the party; that’s how negative the reception was. 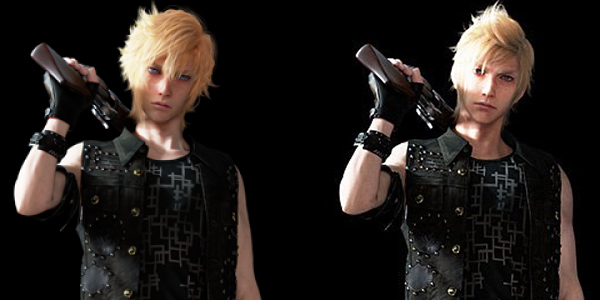 In addition to his personality, Prompto’s character design was also met with criticism as well, and more than once, his facial features were given an overhaul to appease the fans (although in this case I have to agree for the reasons you see in the picture below). For a single character in a video game to receive this much pushback and correction is crazy, and there was a real chance that Prompto’s character would be disliked all across the board. Before and after. He looked so weird before! Redesign for the win. But Square pulled it off, and between his excellent dialogue and his camera to personalize him with the players, Prompto has become a fan favorite. 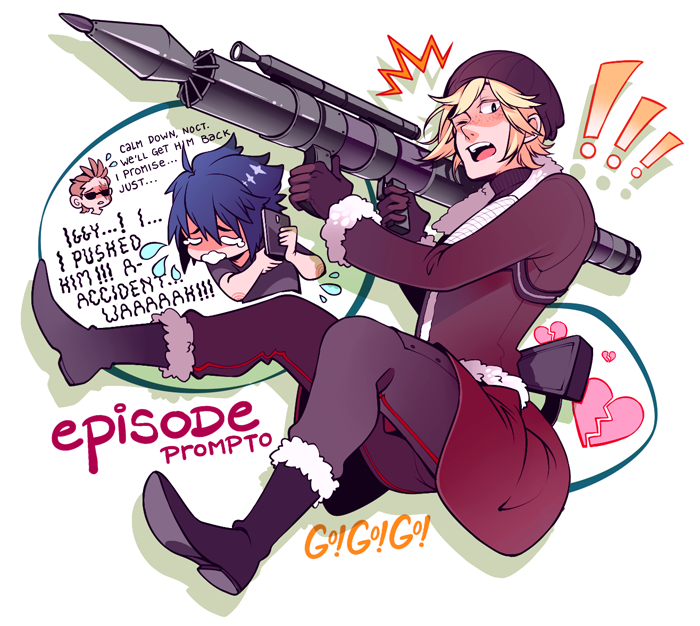 I already loved Prompto from the very beginning, with his fun personality and amusing lines. He always did his best to make light of any situation, and this helped make tense situations more manageable once the story kicks up. But underneath this lighthearted, passionate personality is a deeply conflicted individual. We got hints of this side of Prompto near the end of Final Fantasy XV, but his inner turmoil is on full display in the DLC release of a Prompto-centric story, Episode Prompto. Warning! At this point, there will be spoilers about Prompto from both stories in Final Fantasy XV, Final Fantasy XV Brotherhood, and Episode Prompto. If you have not played/watched them and don’t want to have them spoiled, don’t read any further! 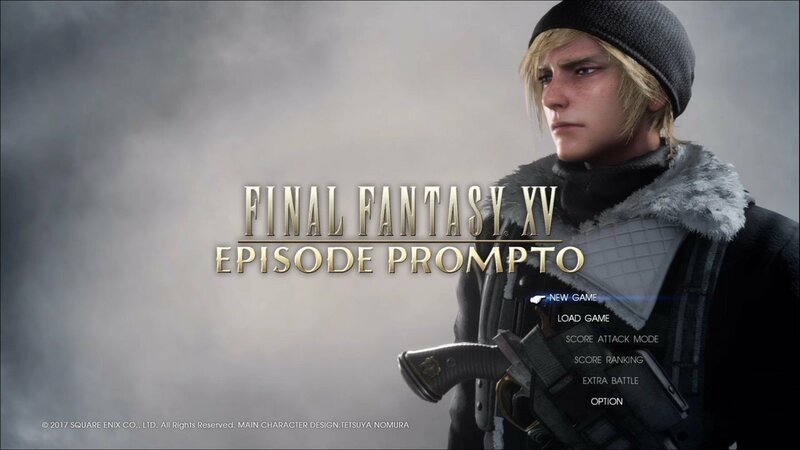 Episode Prompto is a short DLC side story that focuses on Prompto following his separation from Noctis and the group. At its core, this story is meant to focus on Prompto’s psychology, and does an excellent job thanks to the gorgeous backdrop of a snowy wasteland for Prompto to explore. After being trapped in a research facility and trying to make his escape, Prompto comes across the very disturbing truth that he is part of the horrific experiments to create magitek soldiers and is a “clone” of Verstael. The barcode on his wrist, something he always hid from others, is exposed and acts as a reminder of his “inhuman” status. Conflicted, the players have the option for Prompto to follow through with burning the barcode while resting at a campfire site, or backing out. This is a very dark action for Prompto to potentially take, developing a much more anxious, insecure young man from the one we recognize. All aboard the Beanie Prompto train of sadness! This anxiety may seem new or out of place, but it’s present even in Final Fantasy XV. Even before Prompto learns what he is, he does express fear of being inadequate in his duties to protect Noctis. Not only that, but he’s also afraid that if he fails in his role, the group will leave him behind and not want or need him. This stems all the way from his childhood, which is also explored in the anime, Brotherhood: Final Fantasy XV. In this episode of the anime, Prompto is portrayed as very reclusive and quiet in his youth, and his weight caused him to feel that he couldn’t have friends. After meeting Noctis, he decides that he wants to be his friend, and rather than closing himself off like normal, he makes more of an effort to engage and become a stronger person. Originally, I didn’t love Brotherhood‘s implied message suggesting that Prompto didn’t have friends because he was overweight and therefore needed to lose it in order to have friends. But luckily, Prompto’s faulty line of reasoning (thinking he needed to lose weight to be Noctis’ friend) is redeemed by both Final Fantasy XV and Episode Prompto. Prompto’s chipper attitude on the surface belies deeper, serious issues of insecurity, ranging from his appearance to his identity, leading him to think irrationally and fear being alone again. This all comes to a head in Episode Prompto when he has to decide what he wants from life, where he belongs, and whether or not his friends should know the truth. With Aranea’s support and guidance, Prompto is able to reconnect with his past way of thinking and apply it to the present. He doesn’t want to be alone again, and despite being scared about what Noctis and the others will think when they discover his identity, he chooses to be true to both them and himself by staying with them until the end. Their friendship is the best. Prompto is a fantastic character, and not only is this compounded by the time and effort that went into writing his character, but also with the incredible voice direction and acting by Robbie Daymond. It’s in games like this where the voice acting can really make or break a character. Here, especially in Episode Prompto, it completely enhances Prompto’s personality and emotional growth. Every emotion that Prompto experiences can be felt not just through his facial expressions, but heard so clearly in his voice as well. Robbie Daymond did an incredible job, and his voice acting is a big factor in why Prompto has become my favorite character in the game. A character can be happy-go-lucky all they like, but without an emotional core, it can be difficult to invest in them. Prompto has a great balance of both a jovial, sweet personality and feelings of uncertainty, making him feel more like a true person rather than a fictional creation. Square expertly incorporated the feedback they received from fans to create a dynamic, interesting character that would both be relevant to their narrative while also being someone everyone loved. Square had to put up with a lot, but the end result was totally worth it. Slay, my little Chocobro. SLAY. I never had the chance to play any Final Fantasy titles. But reading this article and seeing how deep the characters are, made me want to play it, but then I don’t know where to start. Final Fantasy XV really looks great but is it related to other titles? or can I play it as an standalone story? without knowing any backgrounds of characters or the world they’re in. I have good news! The Final Fantasy games are all standalone games (except for the ones that are denoted as direct sequels: for example, there’s Final Fantasy X and it’s sequel, X-2). All of the games feature original stories, but there are certain terms and creatures that show up in all of them, such as Chocobos, Moogles, Summons like Ifrit, Shiva, etc. So you can start wherever! Which is nice, and there’s no pressure to play them in chronological order. I managed to skip over the spoilery parts of your post, but I agree! 🙂 I still have to finish the whole game and then play the DLC episodes, but I think 15 did a really great job with the characters. Especially with the long development cycle and the rumored issues the game had along the way, it made everyone nervous if 15 was going to be a good game by the time it was ready to be released out into the world. Thankfully, the game turned out to be a success! Prompto and Ignis are my top favorites. Then again, all the guys are really likable. You can’t imagine one without the other. I think each of them are important in making the friendship as real and deep as it feels in the game. I’m also glad the writers worked hard on making their characters complicated individuals beyond the smiles and jokes you see in the game. Like you said, it’s pointless to have a happy-go-lucky character who doesn’t have some internal struggles to deal with. Character growth is a huge part of any plot. Without it, you really just won’t care about the characters or they won’t be worth remembering either. Great post! Thank you! Glad you enjoyed it! 😀 I definitely agree there! The characters are easily the best part of the game, which is so great after everything the game went through in the developmental stages. Especially Prompto! He really goes through a lot, which is so great because it makes him memorable. He’s not just a happy-go-lucky jokster, there’s a lot going on mentally that he has to deal with, so the fact that he does and comes out stronger in the end is so great.